Sasol’s new value chain-based operating model came into effect in 2014. Towards this end, the Sasol Group is now organised into two upstream business units, three regional operating hubs, and four customer-facing strategic business units, supported by fit-for-purpose functions as reflected in our new Sasol website. By combining the talent of our people and our technological advantage, Sasol has been a pioneer in innovation for over six decades. As market needs and stakeholder expectations have changed, so too have our methods, facilities and products, driving progress to deliver long-term shareholder value sustainably. The growth and enhancement of our foundation businesses in Southern Africa is complemented by the significant chapter of growth, Sasol has entered in its history. At Sasol, we recognise the growing need for countries to secure supply of energy and chemicals. For many countries, specifically those with abundant hydrocarbons, in-country conversion of these resources into liquid fuels and chemicals goes a long way to boost national economies. Sasol’s focused and strong project pipeline means we are actively capitalising on the growth opportunities that play to our strengths in Southern Africa and North America. Our focus is creating value sustainably and we are proud to be taking this company, to new frontiers. Sasol was established in 1950 in South Africa and we remain one of the country’s largest investors in capital projects, skills development and technological research and development. The company is listed on the JSE in South Africa and on the New York Stock Exchange in the United States. Sasol's Operating Business Units comprise our mining and exploration and production of oil and gas activities, focused on feedstock supply. Sasol Exploration and Production International (SEPI) develops and manages the group’s upstream interests in oil and gas exploration and production in Mozambique, South Africa, Canada, Gabon and Australia. SEPI is driving the development of Sasol’s upstream business to allow the group to meet its strategic objective of accelerating the growth of its proprietary gas-to-liquid (GTL) technology. In recent years we have taken a number of steps to expand our global upstream portfolio, encouraged by the global abundance of natural gas and the rapid development of the shale gas industry, as well as the lower carbon intensity of natural gas. Sasol experienced some challenges with regards to our operational performance in the first quarter of the year, largely due to the extended planned shutdown at SSO which impacted production and sales volumes across the value chain. We did however deliver a stronger operational performance in the second quarter of the year and are maintaining stable operations. Our current production run-rates at SSO support an annualised run-rate of 7,8 million tons. In Europe, our operations maintained their good performance, but were affected by external ethylene supply constraints which impacted sales volumes. - Base Chemicals sales volumes decreased by 11%, impacted by the extended shutdown at SSO and lower fertiliser demand. Our 50% joint venture high density polyethylene plant (HDPE) in the US with INEOS Olefins and Polymers USA is ramping up to expectations and delivered 91 kt of saleable product for Sasol for the six months. - Average Brent crude oil prices to remain between US$60/bbl and US$65/bbl. So basically the share price over the last 3 years has remained relatively flat, with the share price return over 3 years being just below 0%. While over a 5 year period the share price has actually declined by 23.3% (or basically SOL lost a quarter of its value). So what do we value SASOL shares at based on its current financial results, their expectations of where the crude oil price will be for the next 6 months, their cash generation capacity, their profits and dividends per share and their planned capex in the short term? Well our valuation model places a value of R486 a share. Assuming the second half of their financial year yields the same sort of profits and cash generation as the first 6 months of their financial results. 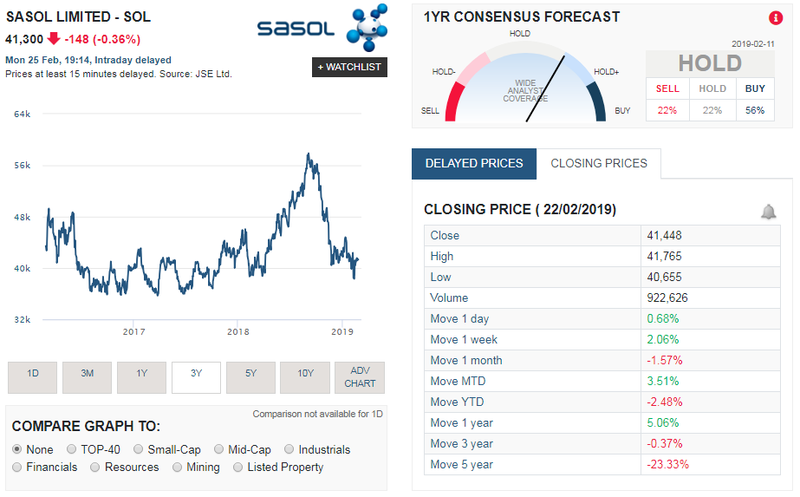 We therefore feel they do offer value at their current price, but with SASOL it is extremely hard to predict their earnings such it is dependent on crude oil and chemicals prices which tend to vary wildly over short amounts of time. And the Lake Charles Chemicals Project might still weigh on them for a while, until it comes online fully and its starts paying back all the capex invested in it.